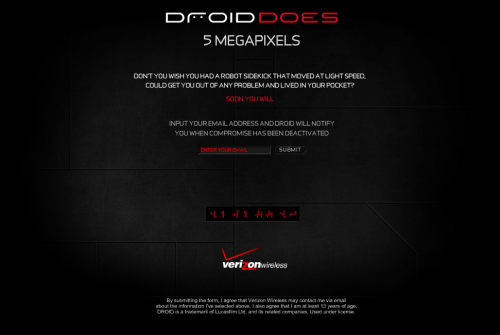 Just saw the droid one,i thought it was funny…..It is fair compatition,verizon is just two years too late. the 3g map thing is silly cause from what i heard from AT&T techs is that verizon does not come close to the load AT&T has on their so called 3G network. though i m a big fan of apple and iphone i like this new add as it makes iphone more competitive and it might make steve and whole apple rethink about their strategies about iphone not able to do things pointed out in the add. Though i bought 3gs when it was launched without subsidize price i.e $399 + tax i might move to verizion if i like this new android phone bcoz. at&t don’t have 3g coverage in my area and im paying for 3g data which is crazy. But verizion does. Agreed! The big picture is that all the other companies are just copying Apple and adding their own gimmicks. This ad is good however in that it will push Apple to open up and be more competitive and make the iPhone EVEN better! I’ve seen the competition, and although they claim to do more, the overall quality of the phone is just not the same. (ie: the HTC Android phone looks like a cheap piece of plastic). When is competition (outside of the gov’t injecting itself) bad for the consumer? I hear Verizon is coming into the twenty first century and going GSM. • Physical keyboard – There are two camps. One that thinks it needs actual keys, one that doesn’t. It’s a personal choice. • Simultaneous apps – Technically, iPhone does run a few Apple apps simultaneously. But the ad has a point. I wonder what the Droid’s battery life is like when running multiple apps though. • 5MP camera. Nokia/Sony could make the same claim about their 8MP cameraphones vs Droid. • Customization. Droid will be the MySpace of skinned phones I guess. • Widgets. Because touching an app icon is so difficult? • No flash for the camera. Fair enough. • Interchangeable batteries. Fair. But let’s see what Droid’s battery life is before conceding the point. I seriously doubt that any iPhone user considers the above to be faults at this stage… by now there are plenty of alternative devices, and if they haven’t switched, they still won’t. Now maybe the Droid/Android 2.0 phone will be a great phone (which I hope, as it will continue to keep pressure on all manufacturers to up their game, including Apple), but comparing it to a iPhone isn’t much of a strategy. I’m prepared to be proven wrong. I love my iPhone. But that is a great commercial. I don’t see myself leaving AT&T anytime soon as I’ve been a relatively happy customer for over a decade. But if Apple finds a way to break jailbreak for good, I will jump ship very quickly. To the most powerful, open handset I can find. And that’s really saying something considering I used a stock iPhone for two years. Some of you may remember me on here back in early July asking for help on how to unjailbreak my phone. That was my first time jailbreaking and I was just real paranoid about messing up my phone and being stuck with a messed up phone with a voided warranty. I’ve since come to my senses and simply couldn’t live without jailbreak now. I’ve never been a fan of Apple and seeing what my phone is actually capable of all while Apple is trying their darnest to keep it restricted has made me HATE APPLE. So if Apple can somehow create an unjailbreakable firmware for my 3GS, I of course won’t update to it, I’ll unlock my phone and put it on eBay asap. i thought verizon was supposed to come out with a cdma version of iphone in like a year or so?